What do the first two races tell us about how the rest of the season will go? Remember, last year Matt Kenseth got off to a rousing start by winning the first two races, then faded and didn’t even make the championship Chase. On the flip side, Mark Martin got off to a stumbling start, was counted out by some sports columnists (mentioning no names), then staged an incredible rally to not only make the Chase but finish second. So while there’s no clear-cut pattern for the rest of the season going into this weekend’s third race at Las Vegas, there are some indicators. The biggest is Jimmie Johnson’s victory at California last Sunday. It traditionally takes Johnson awhile to pick up speed. If he starts out hot it’s scary to imagine what he’ll be like on into the season when he and his team really hit their stride. Then there’s Dale Earnhardt Jr.’s California quake – car failure and a 32nd-place finish after a promising 2nd at Daytona. Junior plunged from 2nd to 14th in the standings. It’s an ominous early-season hole for Junior fans. More optimistic is the outlook for Richard Childress Racing. After last year’s Chase shutout the RCR drivers have come back strong so far this year with three drivers in the Top 5. 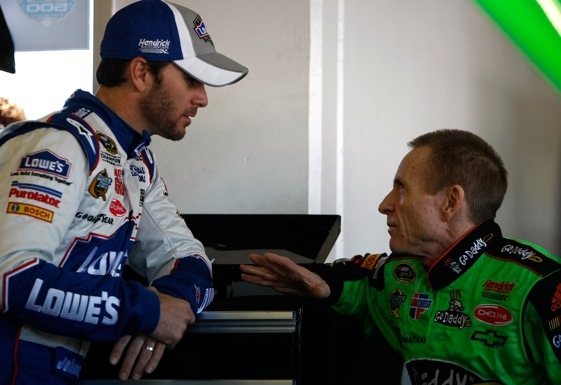 Hendrick Racing has had mixed results, although it has two drivers in the Top 12. I believe when the dust settles after a few more races we’ll see the three familiar faces back near the top: Johnson, Mark Martin and Jeff Gordon. The jury’s still out on Junior. One puzzler: Tony Stewart. The one-time terror of the track barely gets noticed any more. He flew under the radar all of last season and so far he’s done the same this year. Not good, not bad, just sort of treading water and making no waves. Neither had been Tony’s style in the past. Since the inception of the Chase for the Sprint Cup – NASCAR’s playoffs – there has been an increased sense of early-season urgency. It’s a 26-race “regular season.” That means drivers have 24 more races to make the Chase. I don’t think drivers who have sputtered so far need to start looking for the panic button on the dashboard – remember Mark Martin – but there are some early-warning signs. There’s a lot of good drivers outside the critical Top 12, including Jeff Gordon back in 22nd place. They need to get going, while the current occupants of the Top 12 spots know they have to dig in and hang on. September 11 – D Day for finalizing the Chase field – seems like a long way off. But nowadays a driver who dallies too long at the start may be left behind when the train pulls out.